I need comfort food. Now. Tout de suite! 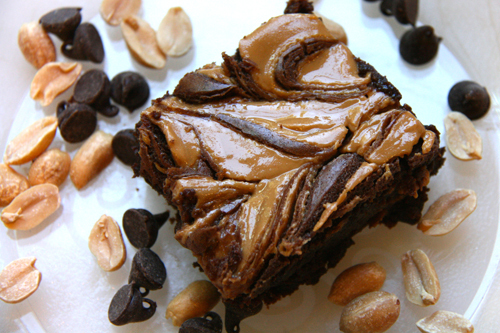 What says comfort food better than the beautiful marriage of chocolate and peanut butter in a nice hefty, rich brownie?! Categories: Chocolate, Cookies, Other Desserts | Tags: chocolate peanut butter swirl brownies; Ina Garten's Peanut butter brownies | Permalink. I have found some delicious looking holiday treats around the blogosphere and am so excited to share them with you here. I have a crazy obsession with the Sound of Music so please try to sing along if you wouldn’t mind. These are a few of my favorite postings. I simply remember my favorite postings, and then I don’t feel so bad! Merry Christmas to all with hopes that you enjoy all the delicious foods that the holidays have to offer! Sometimes we forget how lucky we are to enjoy all the food of the season. Help us fight childhood hunger through ﻿Share Our Strength. Click the link on the Share our Strength badge to help. 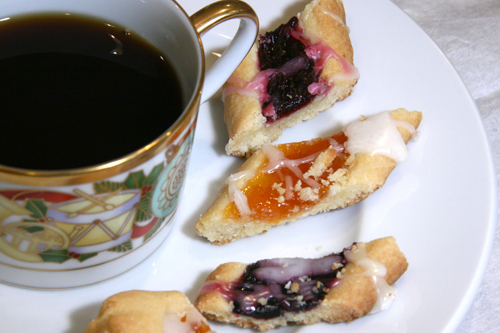 Finnish Ribbon Cookies are dainty little butter cookies that get filled with gourmet jams and drizzled with a citrus-y glaze. These are the perfect pretty little bites to have on your plate with your tea or coffee, and I have never met a soul that could stop at eating just one. Categories: Christmas, Cookies | Tags: apricot cookies, butter cookies, Christmas cookies, Finnish ribbon cookies, jam filled cookies, raspberry jam cookies, strawberry jam cookies | Permalink. These cookies will absolutely rock your holiday lovin’ world. 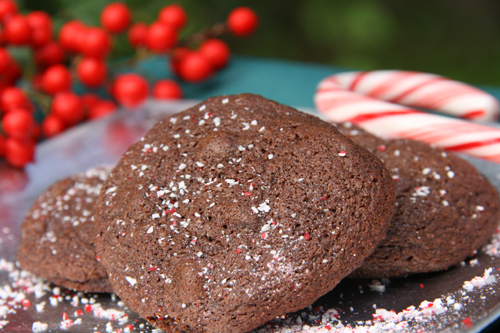 They are lightly crisp, triple hitting chocolate decadence AND…and this is a big AND…they have natural peppermint added to the batter and lovely candy cane dust on top. You will not be disappointed. In fact, you will love me for these! Categories: Chocolate, Christmas, Cookies | Tags: chocolate peppermint cookies, Christmas cookies, Death by Chocolate cookies | Permalink. O.K. 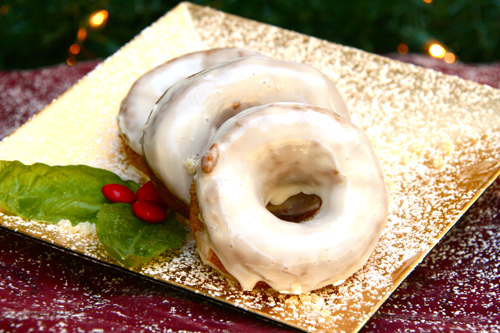 friends, these soft and spicy gingerbread doughnuts are honestly one of the best things I have ever created. Did you catch that?!!! I created this doughnut recipe!!! I am very excited about this fact. Can you tell? The number of exclamation points are exponentially related to how excited I am. 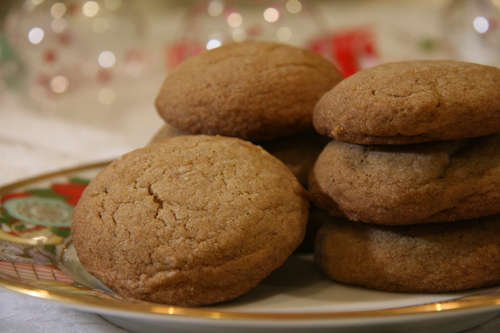 Categories: Bread, Christmas, Fried and Fabulous | Tags: eggnog icing, gingerbread doughnuts | Permalink. 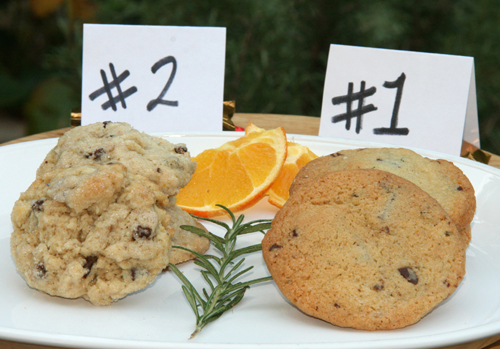 An Orange and Rosemary Chocolate Chip Cookie Throwdown—With Myself! I am a lucky, lucky girl. I get my organic CSA produce box delivered with a little something sweet tucked in on top of all the fruits and veggies. Auntie Em’s produce delivery is run by local chef extraordinaire, Theresa Wahl of Bobby Flay Throwdown cupcake fame (her Red Velvets beat him out). Categories: Cookies | Tags: Auntie Em's orange cookies, Orange and Rosemary chocolate chip cookies | Permalink. Remember Ginger from Gilligan’s Island? The hot, spicy redheaded vixen? Well, I do believe she was aptly named because ginger is all that and more. After all ginger is spicy, daring, and adds life to any dish. Categories: Bread, Breakfast, Christmas, Cookies | Tags: Christmas breakfast, Christmas pancakes, ginger crinkle cookies, gingerbread cookies, gingerbread pancakes, spice cookies | Permalink.